Calving of glacial ice into the ocean from the Greenland Ice Sheet is an important component of global sea level rise. The calving process itself is relatively poorly observed, understood, and modeled; as such, it represents a bottleneck in improving future global sea level estimates in climate models. We organized a pilot project to observe the calving process at Helheim Glacier in East Greenland in an effort to better understand it. During an intensive one-week survey, we deployed a suite of instrumentation including a terrestrial radar interferometer, GPS receivers, seismometers, tsunameters, and an automated weather station. This effort captured a calving process and measured various glaciological, oceanographic, and atmospheric parameters before, during, and after the event. One outcome of our observations is evidence that the calving process actually consists of a number of discrete events, spread out over time, in this instance over at least two days. This time span has implications for models of the process. Realistic projections of future global sea level will depend on accurate parametrization of calving, which will require more sustained observations. Holland, D.M., D. Voytenko, K. Christianson, T.H. Dixon, M.J. Mei, B.R. Parizek, I. Vaňková, R.T. Walker, J.I. Walter, K. Nicholls, and D. Holland. 2016. An intensive observation of calving at Helheim Glacier, East Greenland. Oceanography 29(4):46–61, https://doi.org/10.5670/oceanog.2016.98. Alley, R.B., H.J. Horgan, I. Joughin, K.M. Cuffey, T.K. Dupont, B.R. Parizek, S. Anandakrishnan, and J. Bassis. 2008. A simple law for ice-shelf calving. Science 322(5906):1,344, https://doi.org/10.1126/science.1162543. Amundson, J.M., J.F. Clinton, M. Fahnestock, M. Truffer, M.P. Lüthi, and R.J. Motyka. 2012. Observing calving-generated ocean waves with coastal broadband seismometers, Jakobshavn Isbræ, Greenland. Annals of Glaciology 53(60):79–84, https://doi.org/​10.3189/2012/AoG60A200. Amundson, J.M., M. Fahnestock, M. Truffer, J. Brown, M.P. Luthi, and R.J. Motyka. 2010. Ice mélange dynamics and implications for terminus stability, Jakobshavn Isbræ, Greenland. Journal of Geophysical Research 115, F01005, https://doi.org/10.1029/2009JF001405. Amundson, J.M., and M. Truffer. 2010. A unifying framework for iceberg-calving models. Journal of Glaciology 56(199):822–830, https://doi.org/​10.3189/002214310794457173. Amundson, J.M., M. Truffer, M.P. Lüthi, M. Fahnestock, M. West, and R.J. Motyka. 2008. Glacier, fjord, and seismic response to recent large calving events, Jakobshavn Isbræ, Greenland. Geophysical Research Letters 35, L22501, https://doi.org/​10.1029/2008GL035281. Bartholomaus, T.C., J.M. Amundson, J.I. Walter, S. O’Neel, M.E. West, and C.F. Larsen. 2015. Subglacial discharge at tidewater glaciers revealed by seismic tremor. Geophysical Research Letters 42(15):6,391–6,398, https://doi.org/10.1002/2015GL064590. Bassis, J.N. 2011. The statistical physics of iceberg calving and the emergence of universal calving laws. Journal of Glaciology 57(201):3–16, https://doi.org/10.3189/002214311795306745. Bassis, J.N., and C.C. Walker. 2011. Upper and lower limits on the stability of calving glaciers from the yield strength envelope of ice. Proceedings of the Royal Society A, https://doi.org/10.1098/rspa.2011.0422. Benn, D.I., C.R. Warren, and R.H Mottram. 2007. Calving processes and the dynamics of calving glaciers. Earth-Science Reviews 82:143–179, https://doi.org/10.1016/j.earscirev.2007.02.002. Böning, C.W., E. Behrens, A. Biastoch, K. Getzlaff, and J.L. Bamber. 2016. Emerging impact of Greenland meltwater on deepwater formation in the North Atlantic Ocean. Nature Geoscience 9:523–527, https://doi.org/10.1038/ngeo2740. Bromirski, P.D., O.V. Sergienko, and D.R. MacAyeal. 2010. Transoceanic infragravity waves impacting Antarctic ice shelves. Geophysical Research Letters 37, L02502, https://doi.org/​10.1029/2009GL041488. Brown, C.S., M.F. Meier, and A. Post. 1982. Calving Speed of Alaska Tidewater Glaciers with Applications to the Columbia Glacier, Alaska. US Geological Survey Professional Paper 1258-C, 13 pp. Caduff, R., F. Schlunegger, A. Kos, and A. Wiesmann. 2015. A review of terrestrial radar interferometry for measuring surface change in the geosciences. Earth Surface Processes and Landforms 40(2):208–228, https://doi.org/10.1002/esp.3656. Chen, G. 1998. GPS Kinematics Positioning for Airborne Laser Altimetry at Long Valley, California. PhD thesis, Massachusetts Institute of Technology, Cambridge, MA, USA. Colgan, W., H. Rajaram, W. Abdalati, C. McCutchan, R. Mottram, M. Moussavi, and S. Grigsby. 2016. Glacier crevasses: Observations, models and mass balance implications. Reviews of Geophysics 54:119–161, https://doi.org/​10.1002/​2015RG000504. De Angelis, H., and P. Skvarca. 2003. Glacier surge after ice shelf collapse. Science 299(5612):1,560–1,562, https://doi.org/10.1126/science.1077987. DeConto, R.M., and D. Pollard. 2016. Contribution of Antarctica to past and future sea-level rise. Nature 531(7596):591–597, https://doi.org/10.1038/nature17145. Goldstein, R.M., H. Engelhardt, W.B. Kamb, and R.M. Frohlich. 1993. Satellite radar interferometry for monitoring ice sheet motion: Application to an Antarctic ice stream. Science 262:1,525–1,530, https://doi.org/10.1126/science.262.5139.1525. Glen, J.W. 1958. The flow law of ice: A discussion of the assumptions made in glacier theory, their experimental foundations and consequences. International Association of Hydrological Sciences Publishing 47:171–183. Hibler, W.D. 1979. A dynamic thermodynamic sea ice model. Journal of Physical Oceanography 9(4):815–846, https://doi.org/​10.1175/1520-0485(1979)009<0815:ADTSIM>​2.0.CO;2. Holland, D.M., R.H. Thomas, B. DeYoung, M.H. Ribergaard, and B. Lyberth. 2008. Acceleration of Jakobshavn Isbræ triggered by warm subsurface ocean waters. Nature Geoscience 1:659–664, https://doi.org/10.1038/ngeo316. Howat, I.M., I. Joughin, S. Tulaczyk, and S. Gogineni. 2005. Rapid retreat and acceleration of Helheim glacier, east Greenland. Geophysical Research Letters 32, L22502, https://doi.org/​10.1029/2005GL024737. Howat, I.M., A. Negrete, and B.E. Smith. 2014. The Greenland Ice Mapping Project (GIMP) land classification and surface elevation datasets. The Cryosphere 8:1,509–1,518, https://doi.org/10.5194/tc-8-1509-2014. IPCC (Intergovernmental Panel on Climate Change). 2007. Climate Change 2007: The Physical Science Basis. Contribution of Working Group I to the Fourth Assessment Report of the Intergovernmental Panel on Climate Change. S. Solomon, D. Qin, M. Manning, Z. Chen, M. Marquis, K.B. Averyt, M. Tignor and H.L. Miller, eds, Cambridge University Press, Cambridge, United Kingdom, and New York, NY, USA, 996 pp. IPCC. 2013. Climate Change 2013: The Physical Science Basis. Contribution of Working Group I to the Fifth Assessment Report of the Intergovernmental Panel on Climate Change. T.F. Stocker, D. Qin, G.-K. Plattner, M. Tignor, S.K. Allen, J. Boschung, A. Nauels, Y. Xia, V. Bex, and P.M. Midgley, eds, Cambridge University Press, Cambridge, United Kingdom, and New York, NY, USA, 1,535 pp. ISP/DIFF/LAT. 2016. GAMMA Processing Software: Interferometric SAR Processor (ISP), Differential Interferometry and Geocoding package (DIFF), and Land Application Tools (LAT), http://www.gamma-rs.ch/no_cache/software.html. James, T.D., T. Murray, N. Selmes, K. Scharrer, and M. O’Leary. 2014. Buoyant flexure and basal crevassing in dynamic mass loss at Helheim Glacier. Nature Geoscience 7(8):593–596, https://doi.org/​10.1038/ngeo2204. Joughin, I., W. Abdalati, and M. Fahnestock. 2004. 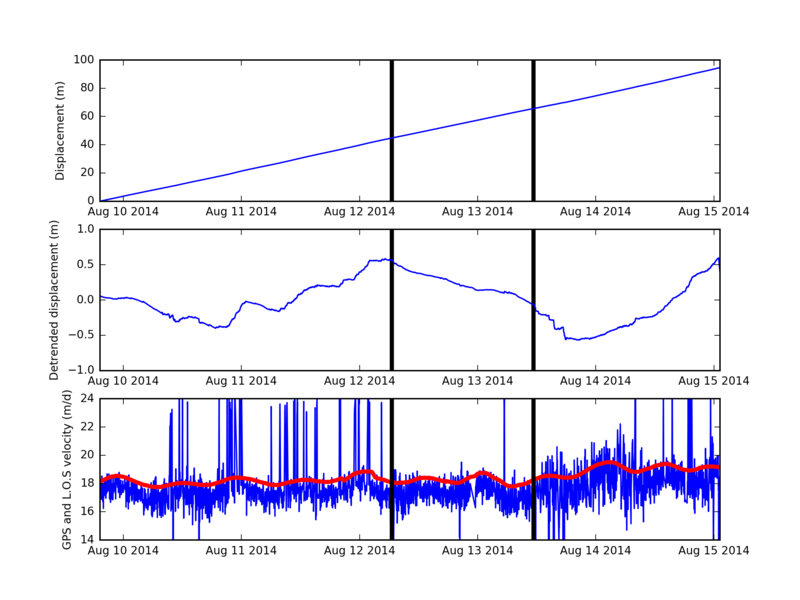 Large fluctuations in speed on Greenland’s Jakobshavn Isbrae glacier. Nature 432:608–610, https://doi.org/10.1038/nature03130. Joughin, I., R.B. Alley, and D.M. Holland. 2012. Ice sheet response to oceanic forcing. Science 338(6111):1,172–1,176, https://doi.org/10.1126/science.1226481. Joughin, I., L. Gray, R. Bindschadler, S. Price, D. Morse, C. Hulbe, K. Mattar, and C. Werner. 1999. Tributaries of West Antarctic ice streams revealed by RADARSAT interferometry. Science 286:283–286, https://doi.org/10.1126/science.286.5438.283. Joughin, I., I.M. Howat, R.B. Alley, G. Ekstrom, M. Fahnestock, T. Moon, M. Nettles, M. Truffer, and V.C. Tsai. 2008. Ice-front variation and tidewater behavior on Helheim and Kangerdlugssuaq Glaciers, Greenland. Journal of Geophysical Research 113, F01004, https://doi.org/10.1029/2007JF000837. Krug, J., J. Weiss, O. Gagliardini, and G. Durand. 2014. Combining damage and fracture mechanics to model calving. The Cryosphere 8(6):2,101–2,117, https://doi.org/10.5194/tc-8-2101-2014. Leuschen, C., and C. Allen. 2013. IceBridge MCoRDS L3 Gridded Ice Thickness, Surface, and Bottom, Version 2, Helheim_2008_2012_Composite. NASA DAAC at the National Snow and Ice Data Center. Boulder, Colorado, http://nsidc.org/data/docs/daac/icebridge/irmcr3. Levermann, A., T. Albrecht, R. Winkelmann, M.A. Martin, M. Haseloff, and I. Joughin. 2012. Kinematic first-order calving law implies potential for abrupt ice-shelf retreat. The Cryosphere 6(2):273–286, https://doi.org/10.5194/tc-6-273-2012. Luckman, A., T. Murray, R. de Lange, and E. Hanna. 2006. Rapid and synchronous ice-dynamic changes in East Greenland. Geophysical Research Letters 33, L03503, https://doi.org/​10.1029/2005GL025428. MacAyeal, D.R., E.A. Okal, R.C. Aster, and J.N. Bassis. 2009. Seismic observations of glaciogenic waves (micro-tsunamis) on icebergs and ice shelves. Journal of Glaciology 55(190):193–206, https://doi.org/10.3189/002214309788608679. Mei, M.J., D.M. Holland, S. Anandakrishnan, and T. Zheng. 2016. 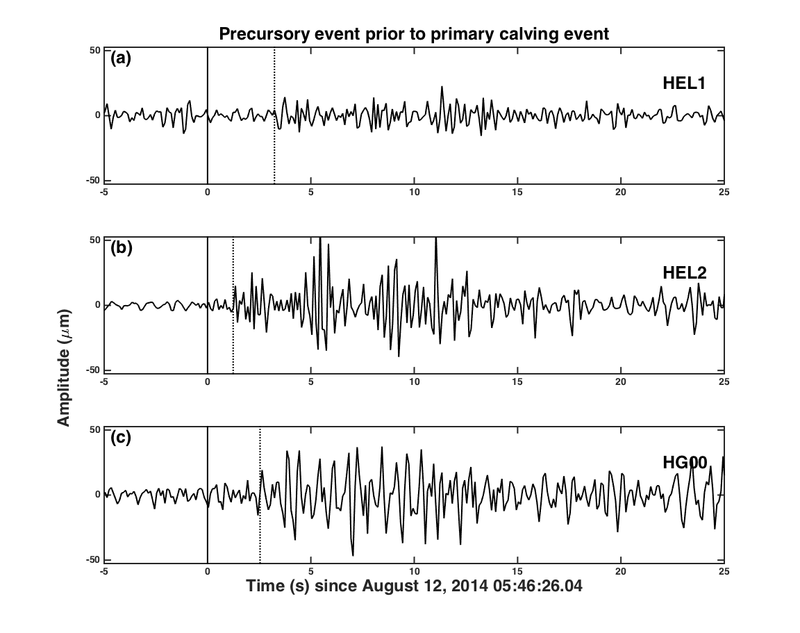 A two-station seismic method to localize glacier calving. The Cryosphere Discussion, https://doi.org/10.5194/tc-2016-85. Murray, T., N. Selmes, T.D. James, S. Edwards, I. Martin, T. O’Farrell, R. Aspey, I. Rutt, M. Nettles, and T. Baugé. 2015. Dynamics of glacier calving at the ungrounded margin of Helheim Glacier, southeast Greenland. Journal of Geophysical Research 120(6):964–982, https://doi.org/​10.1002/2015JF003531. Moon, T., and I. Joughin. 2008. Changes in ice front position on Greenland’s outlet glaciers from 1992 to 2007. Journal of Geophysical Research 113, F02022, https://doi.org/10.1029/2007JF000927. Nettles, M., T. Larsen, P. Elósegui, G. Hamilton, L. Stearns, A. Ahlstrøm, J. Davis, M. Andersen, J. de Juan, and S. Khan. 2008. Step-wise changes in glacier flow speed coincide with calving and glacial earthquakes at Helheim Glacier, Greenland. Geophysical Research Letters 35, L24503, https://doi.org/10.1029/2008GL036127. Nick, F.M., C.J. Van der Veen, A. Vieli, and D.I. Benn. 2010. A physically based calving model applied to marine outlet glaciers and implications for the glacier dynamics. Journal of Glaciology 56(199):781–794, https://doi.org/​10.3189/002214310794457344. O’Leary, M., and P. Christoffersen. 2013. Calving on tidewater glaciers amplified by submarine frontal melting. The Cryosphere 7(1):119–128, https://doi.org/10.5194/tc-7-119-2013. Otero, J., F.J. Navarro, C. Martin, M.L. Cuadrado, and M.I. Corcuera. 2010. A three-dimensional calving model: Numerical experiments on Johnsons Glacier, Livingston Island, Antarctica. Journal of Glaciology 56(196):200–214, https://doi.org/​10.3189/002214310791968539. Parizek, B.R., K. Christianson, S. Anandakrishnan, R.B. Alley, R.T. Walker, R.A. Edwards, D.S. Wolfe, G.T. Bertini, S.K. Rinehart, R.A. Bindschadler, and S.M.J. Nowicki. 2013. Dynamic (in)stability of Thwaites Glacier, West Antarctica. Journal of Geophysical Research 118:638–655, https://doi.org/10.1002/jgrf.20044. Peters, I.R., J.M. Amundson, R. Cassotto, M. Fahnestock, K.N. Darnell, M. Truffer, and W.W. Zhang. 2015. Dynamic jamming of iceberg-choked fjords. Geophysical Research Letters 42(4):1,122–1,129, https://doi.org/​10.1002/2014GL062715. Pralong, A., and M. Funk. 2005. 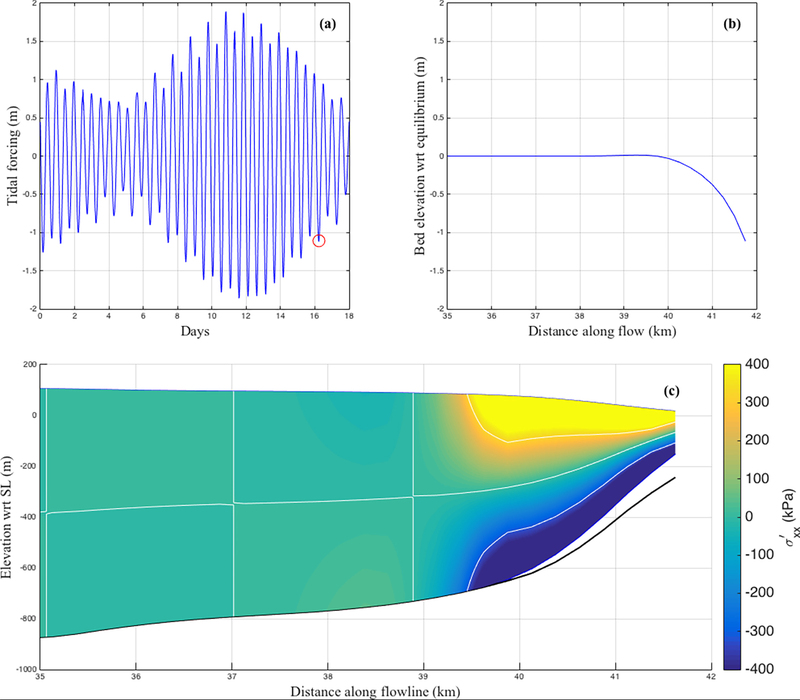 Dynamic damage model of crevasse opening and application to glacier calving. Journal of Geophysical Research 110, B01309, https://doi.org/10.1029/2004JB003104. Riesen, P., T. Strozzi, A. Bauder, A. Wiesmann, and M. Funk. 2011. Short-term surface ice motion variations measured with a ground-based portable real aperture radar interferometer. Journal of Glaciology 57(201):53–60, https://doi.org/​10.3189/002214311795306718. Rignot, E. 1998. Fast recession of a West Antarctic glacier. Science 281(5376):549–551, https://doi.org/10.1126/science.281.5376.549. Rignot, E., and P. Kanagaratnam. 2006. Changes in the velocity structure of the Greenland Ice Sheet. Science 311:986–990, https://doi.org/10.1126/science.1121381. Rodriguez, E., and J.M. Martin. 1992. Theory and design of interferometric synthetic aperture radars. IEE Proceedings F (Radar and Signal Processing) 139(2):147–159, https://doi.org/10.1049/ip-f-2.1992.0018. Scambos, T., H.A. Fricker, C.C. Liu, J. Bohlander, J. Fastook, A. Sargent, R. Masson, and A.-M. Wu. 2009. Ice shelf disintegration by plate bending and hydro-fracture: Satellite observations and model results of the 2008 Wilkins ice shelf break-ups. Earth and Planetary Science Letters 280(1):51–60, https://doi.org/10.1016/j.epsl.2008.12.027. Schjøth, F., C.S. Andresen, F. Straneo, T. Murray, K. Scharrer, and A. Korablev. 2012. Campaign to map the bathymetry of a major Greenland fjord. Eos, Transactions American Geophysical Union 93(14):141–142, https://doi.org/​10.1029/2012EO140001. Sergeant, A., A. Mangeney, E. Stutzmann, J.P. Montagner, F. Walter, L. Moretti, O. Castelnau. 2016. Complex force history of a calving-​generated glacial earthquake derived from broadband seismic inversion. Geophysical Research Letters 43:1,055–1,065, https://doi.org/​10.1002/2015GL066785. Shepherd, A., A. Hubbard, P. Nienow, M. King, M. McMillan, and I. Joughin. 2009. Greenland ice sheet daily motion coupled with daily melting in late summer. Geophysical Research Letters 36, L01501, https://doi.org/10.1029/2008GL035758. Strozzi, T., C. Werner, A. Wiesmann, and U. Wegmuller. 2012. Topography mapping with a portable real-​aperture radar interferometer. IEEE Geoscience and Remote Sensing Letters 9(2):277–281, https://doi.org/10.1109/LGRS.2011.2166751. Taylor, Z.J., R. Gurka, G.A. Kopp, and A. Liberzon. 2010. Long-duration time-​resolved PIV to study unsteady aerodynamics. IEEE Transactions on Instrumentation and Measurement 59(12):3,262–3,269. Timoshenko, S.P., and J.N. Goodier. 1970. Theory of Elasticity, 3rd ed. McGraw-Hill, New York, 567 pp. Truffer, M., and R. Motyka. 2016. Where glaciers meet water: Subaqueous melt and its relevance to glaciers in various settings. Reviews of Geophysics 54:220–239, https://doi.org/​10.1002/2015RG000494. Van der Veen, C.J. 1998. Fracture mechanics approach to penetration of surface crevasses on glaciers. Cold Regions Science and Technology 27:31–47, https://doi.org/10.1016/S0165-232X(97)00022-0. Van der Veen, C.J. 2002. Calving glaciers. Progress in Physical Geography 26:96–122, https://doi.org/​10.1191/0309133302pp327ra. Vaňková, I., and D.M. Holland. 2016. Calving signature in ocean waves at Helheim Glacier and Sermilik Fjord, East Greenland. Journal of Physical Oceanography 46(10):2,925–2,941, https://doi.org/​10.1175/JPO-D-15-0236.1. Vaughan, D.G., and R. Arthern. 2007. Why is it hard to predict the future of ice sheets? Science 315:1,503–1,504, https://doi.org/10.1126/science.1141111. Vieli, A., and F.M. Nick. 2011. Understanding and modelling rapid dynamic changes of tidewater outlet glaciers: Issues and implications. Surveys in Geophysics 32(4–5):437–458, https://doi.org/​10.1007/s10712-011-9132-4. Voytenko, D., T.H. Dixon, I.M. Howat, N. Gourmelen, C. Lembke, C.L. Werner, S. De La Peña, and B. Oddsson. 2015a. Multi-year observations of Breiðamerkurjökull, a marine-terminating glacier in southeastern Iceland, using terrestrial radar interferometry. Journal of Glaciology 61(225):42–54, https://doi.org/10.3189/2015JoG14J099. Voytenko, D., A. Stern, D.M. Holland, T.H. Dixon, K. Christianson, and R.T. Walker. 2015b. Tidally driven ice speed variation at Helheim Glacier, Greenland, observed with terrestrial radar interferometry. Journal of Glaciology 61(226):301–308, https://doi.org/10.3189/2015JoG14J173. Walker, C.C., J.N. Bassis, H.A. Fricker, and R.J. Czerwinski. 2015. Observations in the interannual and spatial variability in rift propagation in the Amery Ice Shelf, Antarctica 2002–2014. Journal of Glaciology 1(226):243–252, https://doi.org/10.3189/2015JoG14J151. Walter, J.I., J.E. Box, S. Tulaczyk, E.E. Brodsky, I.M. Howat, Y. Ahn, and A. Brown. 2012. Oceanic mechanical forcing of a marine-​terminating Greenland glacier. Annals of Glaciology 53(60):181–192, https://doi.org/​10.3189/2012AoG60A083. Weijer, W., M.E. Maltrud, M.W. Hecht, H.A. Dijkstra, and M.A. Kliphuis. 2012. Response of the Atlantic Ocean circulation to Greenland Ice Sheet melting in a strongly-eddying ocean model. Geophysical Research Letters 39, L09606, https://doi.org/​10.1029/2012GL051611. Werner, C., T. Strozzi, A. Wiesmann, and U. Wegmuller. 2008. A real-aperture radar for ground-based differential interferometry. Paper presented at the International IEEE Geoscience and Remote Sensing Symposium, July 7–11, 2008, https://doi.org/10.1109/IGARSS.2008.4779320. Xie, S., T. Dixon, D. Voytenko, D.M. Holland, D. Holland, and T. Zheng. 2016. 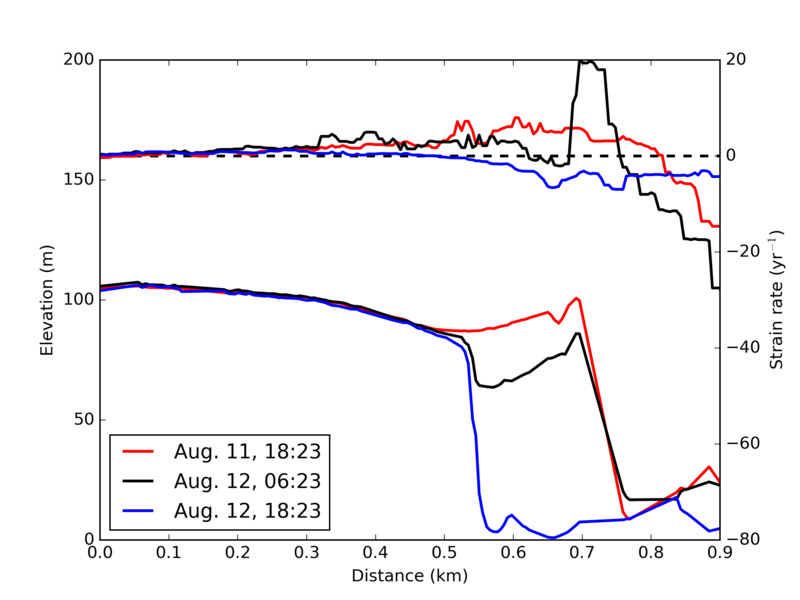 Precursor motion to iceberg calving at Jakobshavn Isbræ, Greenland, observed with terrestrial radar interferometry. Journal of Glaciology 62(236):1,134–1,142, https://doi.org/10.1017/jog.2016.104.